Washington, D.C.'s Democratic primary officially wrapped up the 2016 presidential primary season on June 14. It's actually over, guys, and we've got our presumptive nominees: Donald Trump and Hillary Clinton. Every election is unique, but this one drummed up extra excitement thanks to the unlikely candidacies of Sen. Bernie Sanders on the left and Trump on the right, with people turning out in high numbers compared to past primaries, both in support of and in opposition to them. How many people voted in the 2016 primaries? The Pew Research Center released its turnout report after the June 7 primaries. Up to that point, over 57.6 million people had cast ballots in primaries and caucuses. That's about 28.5 percent of total eligible voters. Pew put this figure into historical context by comparing it to turnout rates for primaries dating back to 1980. 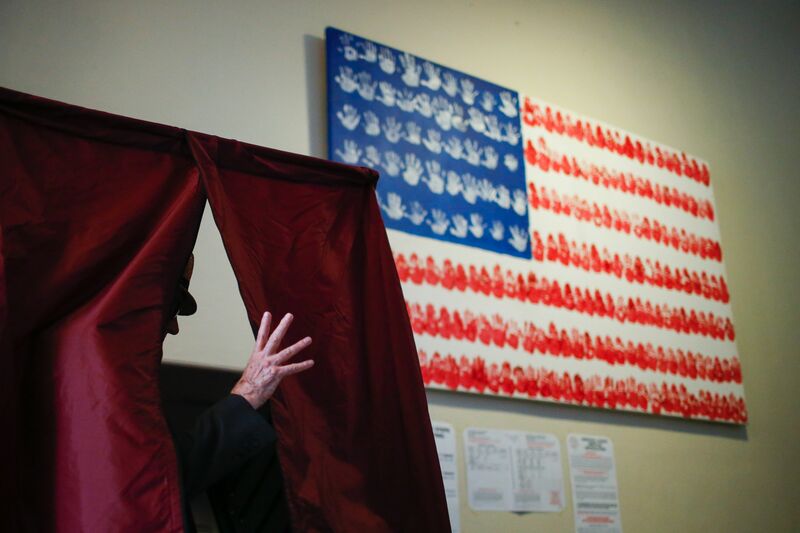 Turnout for the Republican primaries among eligible voters hit a record high for 2016, at 14.8 percent. The second-highest was 11.6 percent in 1980. Turnout for the Democratic primaries is, according to Pew's report, often higher than the Republican contests, but that was just barely not the case in 2016. On the left, 14.4 percent of eligible voters turned out (only 0.4 percent more than the GOP). That's the second-highest turnout since 1988. The Democratic rate was at record-high for the 36-year time span in 2008, when 19.5 percent of eligible voters cast their ballots for either Clinton or now-President Barack Obama. Let's not forget about D.C. The number may change slightly as election results are finalized, but as of Wednesday, the District of Columbia Board of Elections reported that 98,667 ballots were cast in the Democratic primary on Tuesday. That's about 21 percent of D.C.'s registered voters. So in all, about 57.7 million people have voted in the 2016 primaries. As we acknowledge record highs in 2016, it's worth keeping in mind that even the highest primary turnouts attest to the fact that the vast majority of eligible voters don't participate in party nomination processes, and the share of non-primary voters who do vote in November end up choosing between candidates they didn't give their say in. Turnout for general elections is always higher than for primaries — usually, between 50 and 60 percent of eligible voters show up to polls in November on presidential election years. Though it varies by year, that's twice or more than primary turnout. This is likely due to a combination of there being less interest in primaries and the fact that it's easier for independents and third-party voters to participate in a general election. The 2016 primary season saw the highest turnout of voters in Republican primaries since 1980, and the second-highest turnout for the Democratic side since 1988. Still, relatively few eligible voters participated in picking the presidential nominees, as usual.